Super CV transforms gameplay on great ColecoVision games like Burger Time, Donkey Kong, Mr. Do, Pepper II, and many more. The octagonal restrictor plate is the perfect compromise between a 4-way and 8-way joystick, providing distinct landing points for your stick in all eight directions. The Suzo-Happ arcade pushbuttons deliver true left/right two-button control just like the original ColecoVision controllers, while the third and fourth buttons replicate the action of the purple and blue buttons on the Super Action controller, delivering great play on games like Front Line, Rocky: Super Action Boxing, Spy Hunter, and Star Trek: Strategic Operations Simulator. The Super CV is compatible with the Atari 2600 and Atari 7800 (mostly). The joystick and the first fire button on the Super CV duplicate the play of the legendary Atari CX-10 and CX-40 controllers. The Super CV is also fully compatible with all stick-only and one-button Atari 7800 games. These games make up the majority of the Atari 7800 catalog, and some two-button games revert to a single button mode. In Super Cobra and Xevious, for example, the single button fires both cannon and bomb. The Super CV is almost a three console controller for the price of one! The Super CV is built to last. The controller is housed in an 8" x 14" sloped aluminum case that is stable on the table or happy in your lap, with an authentic Sanwa™ JLF-TP-8YT ball-top joystick with an octagonal restrictor plate, four Suzo-Happ pushbuttons, and as custom-made, 12-key membrane keypad. Under the hood, game compatability is maximized with signal processing that is identical to the original controllers - a passive array of diodes that routes control impulses to your console or computer that we call the Easy CV controller board. The molded DB-9 cord length is approximately 5'6" (1.6m). All harness connections are soldered and heatshrink wrapped. The result is a controller to last a lifetime! Your wish is our command! 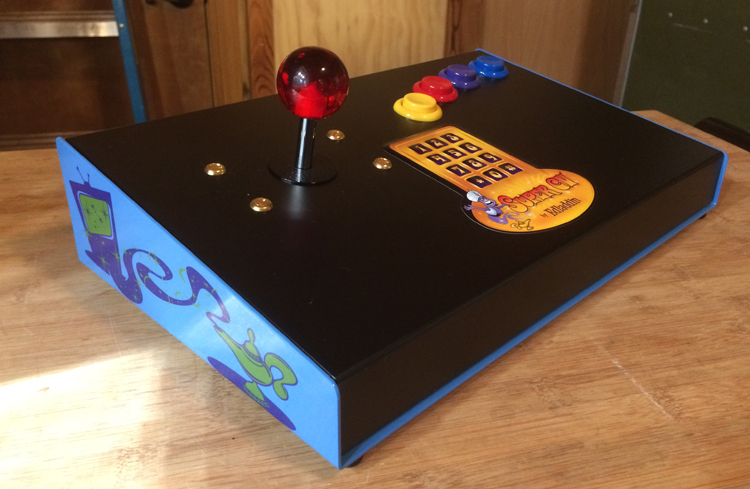 We can build your Super CV with a classic Super Action solid red joystick ball and yellow, red, purple, and blue pushbuttons, or customize your controller from a rainbow of colors including the amazing Hard Candy Gemstone balls in blue, green, yellow, or red. Edladdin controllers are built to order and usually take 3-4 weeks to ship. Sometimes we can get them out sooner, but there are various factors that can affect the time it takes to complete these controllers. Sometimes it takes us longer! You are welcome to email us for an update at any time. You will also receive an email from the store with the tracking number as soon as your order has shipped. Shipping is calculated by the shopping cart using real-time pricing provided by the U.S. Postal Service (worldwide) and UPS (United States). No additional handling or packaging fees are added. We also have accounts with DHL and Fed-Ex. These couriers are consistently more expensive than using the USPS or UPS, however we are happy to utilize them if your situation requires it.